It’s really easy to transition from the summer to the fall. In fact, you only need a few key pieces to take you there. A light-weight army jacket and a summer scarf will do the trick. Did I ACTUALLY wear this outfit today out and about on this rainy AUGUST DAY? No. But I wanted to show you that a pair of wedges will go nicely with Fall touches if you wear them together. Getting a little too hot? Remove a few layers. No problem! 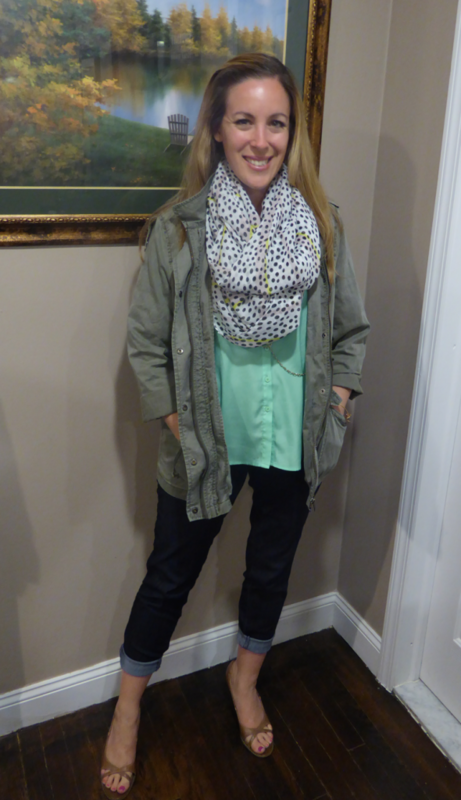 I’m liking the trend of wearing an army jacket (I just love the green) and pairing it with a colorful tank or shirt underneath! Like you said, it seems that easing from summer to fall doesn’t require too much of a wardrobe switch. Adding a cardigan or jacket can make all the difference! Also, the outfit of #3 (nefelibata) is precious! All the black and the the pop of color from the skirt! Perfect!